After quite a bit of research, I’m starting to believe this is a Firstman Mosrite Ventures model. I’ve seen a couple of Japanese sites with near as I can the tell the exact same guitar. 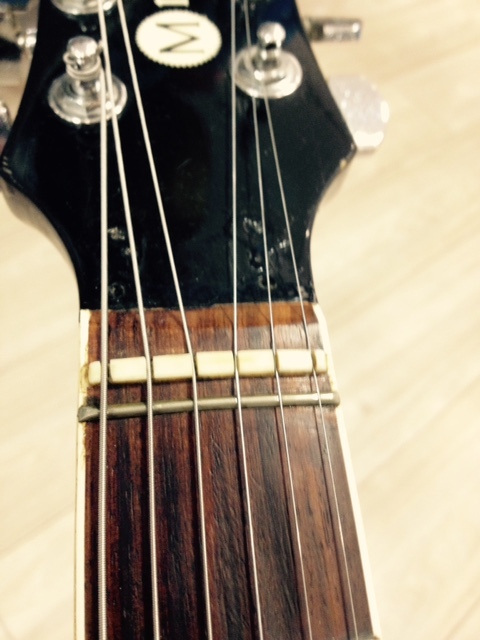 The two screw holes above the nut, I now believe is a truss rod cover or plate that is missing. This is consistent with Firstman having something similar. Note that not all Firstman Mosrite’s have this it seems. Here is a video with pretty much the same looking guitar and hardware except the Ventures logo at the top. However it does have the truss rod cover or plate above the nut. Again, I believe this is missing on the one I am looking at. I just can’t find a photo with both the cover and the Ventures logo just yet. I’m not sure the year. The guitar looks and feels VERY vintage. It’s got that yellowish tint slightly and it’s definitely been gigged with. It just seems the guitar wounds are due to age rather than someone knocking it around. Just saw this online at the Japan Hardoff website. This also looks VERY similar, especially the tuners. The nut still looks a tiny bit different, not sure. The name on this one is a Mosrite VM-65. Note: I’m now finding out that the VM-65 is usually made in Korea. Geez, all of the Mosrite stuff is making my head SPIN! Usually Japan guitars are not this complicated. 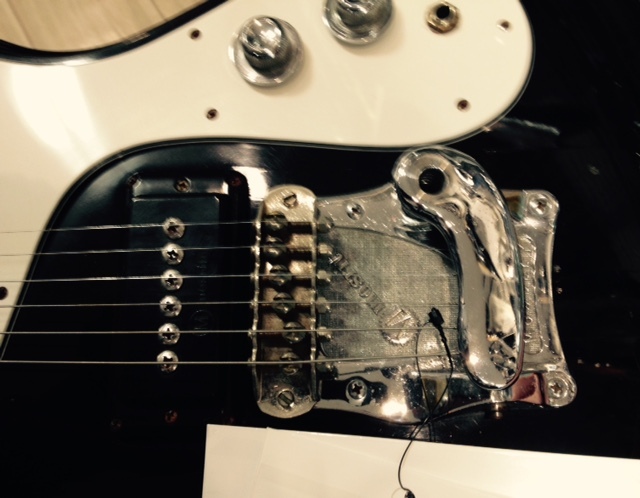 I’ve been in Japan for 22 years now and Mosrite is definitely the winner in confusion…laugh. I checked back with the store today and “finally” figured out that I believe the guitar is a Firstman Mosrite Ventures Model guitar. From what year, I am still unsure and the writing on the info card still says Fillmore, but I’m not sure why. 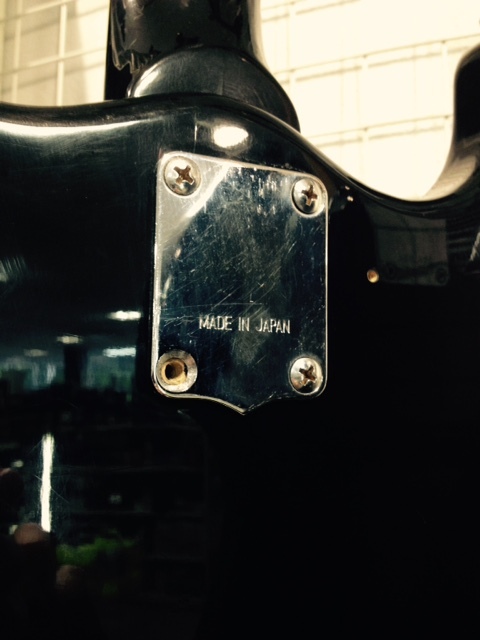 The neck plate I made a mistake is indeed actually a “teardrop” style plate with “Made in Japan” engraved on it. 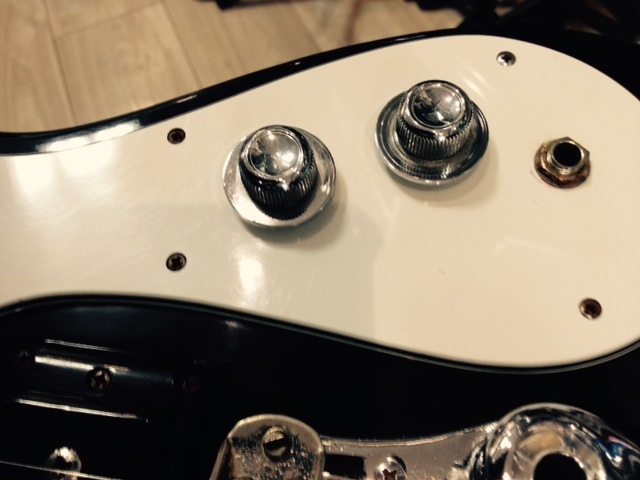 The knobs do not have the “M” Mosrite letter on them, rather they are plain. The Tremelo system says M Mosrite and Moseley respectively. There are black and silver engraved tuners on the head, but no “California of”, just M Mosrite and Ventures Model above that. There is a nut and just below that a skinny fret which actually has dents in it, so I’d have to either replace or file that down. I get kinks in the strings when I bend them from the 5th fret on down. 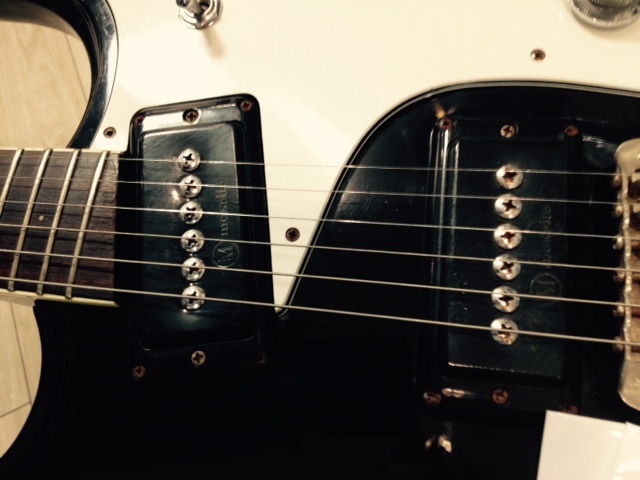 There are four screw holds above the nut that have been filled in which I believe covers the missing truss rod style plate that I see some Firstman Mosrite guitars have. It’s hard to explain, but the guitar feels and looks very 70’s ish to me. The way the finish is down, the discoloring on the neck binding, and the aging of the hardware suggests an 80’s or before model. That’s just my guess though. The guitar sounds and plays very well and likely I’ll pick it up. Right now I’m about 90% sure it’s a Firstman just like the one in the video posted above. I’m learning that some of these Mosrite guitars and copies had a zero fret. I noticed on the guitar I’m looking at that there are grooves in this smaller zero fret. When I bend the strings, mainly the B and E, they pop out of the grooves lower than the 5th fret. This results in a ping sound like a string popping out of the nut. Either you’re not meant to bend the strings lower than the 5th fret which sounds absurd, or the setup is incorrect on this Firstman Mosrite. This is interesting and I’m not sure a way around the problem just yet. Bought the guitar today. I couldn’t resist! It sounds great at home here and I’m glad I purchased it because it really does sound different than any of my Gibson, Fender, and Jackson guitars. There are some minor issues, but for the most part it performs very solid. I now just need to find a replacement tremelo arm which may take some time to locate. Also, I noticed the bridge is backwards similar to what others have reported on this forum. Is it recommended to turn it around or is it ok backwards? It plays fine at the moment.